We have all been there. Sitting in the dark with our eyes fixed on our computer screen thinking: “Am I doing this all right?” You have played safe, followed the search engine guidelines, produced content, been active in social media sharing, but there’s nothing to boast so far. The first three months are expected to be this way but when you are entering the sixth month, the panicky feeling starts. 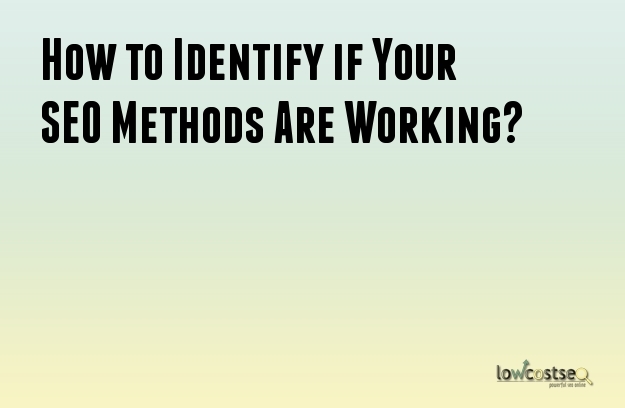 So, let’s begin with the obvious: How do we know if our SEO methods are working? It is when your site visits are increasing, followed by your sales, your links and basically, your branding. These can be tracked by using Google Search Console. Keeping tabs of your data should be prioritized as it is the first thing you’ll need to measure your strategy’s success. Take note that different business industries have different instances which is why we will only cover what’s universal. Your visits potentially come from organic searches (ideally) or from referral traffic. Webmaster tools can track the source of a search. It can also track if a search comes from direct navigation – which means it was clicked through e-mail links and such. The rise of traffic through organic searches is what we are aiming for, because it means that the search user chose your site instead of the other option. Referral traffic efforts are also appreciated but it doesn’t always convert to sales immediately. Identifying the source of your monthly data is beneficial to target the weak points of your strategy and figure out your next move. There are around 10 search engines in play on the web right now. Google, followed by Yahoo! and Bing, may still be on the lead but considering your existence in the most used search engine site in your location should be maximized. For example, if your local business targets consumers in Ireland, you should know that Google’s market share in Ireland reached 95.23% compared to Bing with 2.22% in 2010. If in 2010, you only focused on promoting your ads in Bing’s search engine, then the problem lies on the place where you advertised yourself. This is also true when you’re using social media marketing. Your digital advertising methods are working if your target audience are well informed about your products and services. Before strategizing, you should know where they can be found online. If you find your site mysteriously dropping its traffic in all search engines, then your web pages are probably having issues. This issue is easy to track and quite challenging to diagnose but with regular check-ups, it can be avoided. Watch out for page content that slows down your site’s speed as well like oversized multimedia files or internal errors. Your SEO methods will work if your site is cooperating and delivering easy access features to its users. Keywords and keyword phrases have been a necessity long before SEO started to become a bit complicated. In every query, there is a ranking on which site uses it best. This is a method that the Moz website used to improve their keyword ranking: They measured their ranking on a keyword and improved the landing pages where visitors often opt to become paying customers. Their SEO continues to work because they have analyzed the strongest connection between them and their customers and optimized it to improve their keyword ranking as well. The most practical and useful tool that’s free online as of today. Google accesses many site content from around the globe and carefully crawls it to identify its importance on the web. The search console helps site owners in many ways while continuously giving them full control on how their web pages can function and what content it produces. The search console tool also provides the metrics and data that you are looking for, to develop an effective SEO strategy for your company. It also allows you to know if your site has committed a penalty, giving you the chance to fix it ASAP and go back to your high ranking. Even app developers can take advantage of it to allow search users to find their apps through queries. Not all small business owners have the time to track such metrics which then leads us to the question: Is SEO is helpful for small businesses or not? Apparently, it has been an effective tool for advertising for most Americans and Canadians since 2014. In 2018, it has grown to be a strategy that local brands opt to, to market themselves in a bigger world instead of simply taking local sales. Purchasing SEO Services or Not? The cheapest way is to not divert your attention to paid ads or SEO services that promise gratifying results. Basic SEO methods can work just fine after all, but not as successful as your competition who pays around $20 thousand or $40 thousand for online marketing. Businesses should ask themselves when they are thinking about SEO: “When do I need the results to happen?” Because if speed and quality are indeed what’s needed ASAP, then these SEO services are the best choice. Stepping up your SEO through Lowcostseo can be done from choosing 4 options: Starter, Basic, Elite and Advanced. Each business can consult to an SEO specialist to understand how their brand can be advertised online, what options are available, and if you should start big or small.